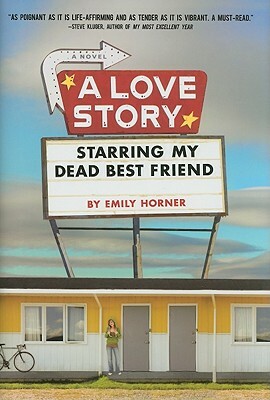 A Love Story Starring My Dead Best Friend by Emily Horner. (Grades 7+) Dial, June 2010. 259 pages. Review copy provided by my local library. Julia died in a car crash. No one saw it coming, least of all Cass. Julia was her best friend. Julia was the one she shared inside jokes with. She loved Julia. And now that Julia's gone, Cass is not sure where she fits in. Yeah, she's kind of got theater friends, but they were Julia's friends, really. And after they decide to put on the musical Julia had been writing, Totally Sweet Ninja Death Squad, and Julia's boyfriend casts the evil Heather Halloway as the lead, Cass has to get away. When she returns, Cass works on the musical, designing sets and catapults and booby traps. And Heather works on costumes next to her in the theater basement. Cass is sure she can never forgive Heather for the horrible way Heather treated her in middle school... but then they start getting to know each other. And Cass starts to fall for Heather. Alternating between Cass's present, working on the musical, and her past, biking to California in memory of Julia, A Love Story Starring My Dead Best Friend pieces together Cass's path from grief to acceptance to moving on with her life. Ohhh, there were many things I loved about this novel. First of all, I love the title and the cover. They're eye-catching and will definitely attract teens to pick up the book. I love Cass's circle of theater friends and their devotion to Julia. I love the musical that they're putting on. One of the things I love most is that it's a GLTB love story that doesn't center on the experience of coming out. And it's more than a love story - it's about friends and grief and finding your place in the world. The love story is just a part of what this book is. Here's the thing, though. I felt like Cass did not have a strong voice. She kind of reminded me of DJ Schwenk from Dairy Queen in her self-deprecating way, but where DJ has a voice you can identify anywhere, I never really felt like I heard Cass's voice. I kept getting the dialog between Cass and Heather mixed up and I didn't have a strong connection with Cass. Bottom line: I think that Emily Horner is definitely an author to watch and I hope to see more from her in the future. If she keeps the geeky-cool humor and intriguing situations and adds a more distinctive voice for her characters, we're all in for a treat. Check out more reviews at The Story Siren, The Happy Nappy Bookseller, The Compulsive Reader and Forever Young Adult (among others). And don't miss Emily's guest post at The Story Siren, part of her GLBT Lit Days feature that ran earlier this year. A Love Story Starring My Dead Best Friend is on shelves now!